Buy Dunsyre Blue cheese – buy online from The Courtyard Dairy. Dunsyre Blue is named after the nearby village of Dunsyre, where the neighbouring farm supplying the milk is based. Dunsyre Blue is a product of the rich cows’ milk farmed in the Pentland Hills overlooking Edinburgh. 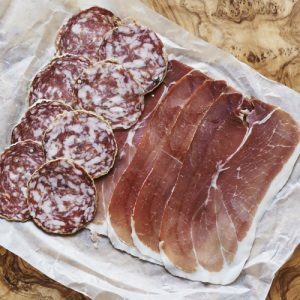 At four months old it has a rich, lingering flavour with full, blue bite. Originally created following a Roquefort recipe, it certainly gives the best French blue cheeses a run for their money. Made by Selina Errington in Carnwath, near Edinburgh, Lanark, Scotland. 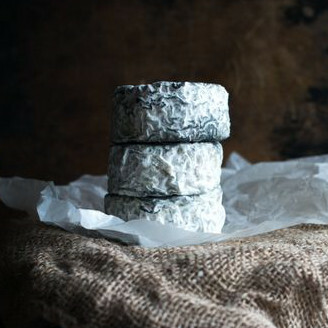 The Erringtons created Dunsyre as a sister to their famous and fabulous sheep’s milk cheese, Lanark Blue. 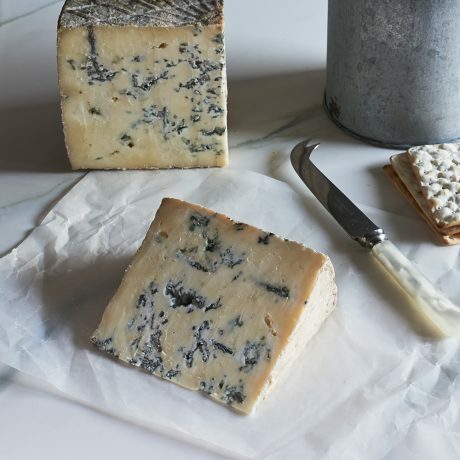 Lanark Blue was originally moulded on a Roquefort recipe crossed with a recipe for making blue cheese written in the 1820s by Sir Walter Scott. As sheep ‘dry-off’ from milking in the winter (ready for lambing), Humphrey Errington was at a loss with what to do with all his cheese-making equipment (and staff) during that period. So in the late 1980s, in an attempt to put his cheese-making equipment to good use and continue to make cheese all year round, Humphrey started sourcing cows’ milk from a nearby farm with a herd of traditional British Friesians. Humphrey created a cows’ milk blue by adapting his Lanark Blue recipe to suit cows’ milk. 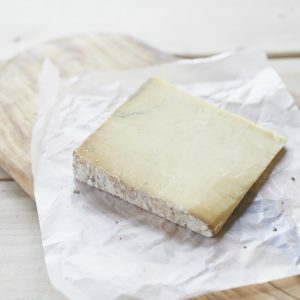 Originally they used an Ayrshire cow milk herd, but switched to Friesian for better milk quality, which, along with tweaking the recipe and maturing temperatures, has shown a remarkable improvement in the cheese). Dunsyre Blue is then pierced at 10 days old to allow the blue mould to form, before being wrapped up in traditional silver foil (like French blues) and matured for four months in the cool temperate climate of Scotland. In the early 2000s Humphrey handed the reins of running the farm and the cheese-making to his daughter, Selina. 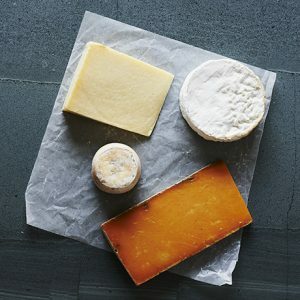 Continuing as a family affair, Selina and her husband Andrew manage the farm, and Angela (Andrew’s sister) manages the cheese-make (with the help of Barry, whose Dad made cheese there with Humphrey and whose son has already started helping out…). Their strong attitude to quality, prime farming, and making the best cheese they can has continued to build on Humphrey’s legacy. Oh! And when the cheese is sealed up in its hand-illustrated packaging, the family affair continues, as the beautiful illustrations are by Selina’s Uncle Tom (Errington).